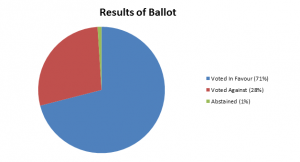 The ballot required two-thirds to be in favour and less than a quarter to be against (taking into account abstentions). The ballot consultation gained over 3,000 comments, the consideration of which will likely delay publication of the standard, until February 2017. Richard Jones, head of policy and public affairs with IOSH said: “While we cannot go into detail, there are a variety of reasons why participating members have voted against this, and these will need to be resolved at a meeting next month. Once concerns about the standard have been addressed, a revised version (DIS2) will be produced for further consultation and ballot.